Nursery and Pre-School graduation entertainment, end of term parties. Wayne Wonder Magic Shows for Nursery's & Pre-Schools. P.T.A fund raising entertainment. Wayne Wonder has developed a show specifically for 3 & 4 year olds. This specially crafted 45 minute Magic Show consists of adorably loveable puppets, lots of slapstick comedy, funny magic and most of all fun. This is the ideal show for an audience that may have never seen a magician before. Ideal for end of term events, annual fun days and very popular for Christmas. Wayne Wonder even adds in Christmas theming for bookings in December for that seasonal touch. 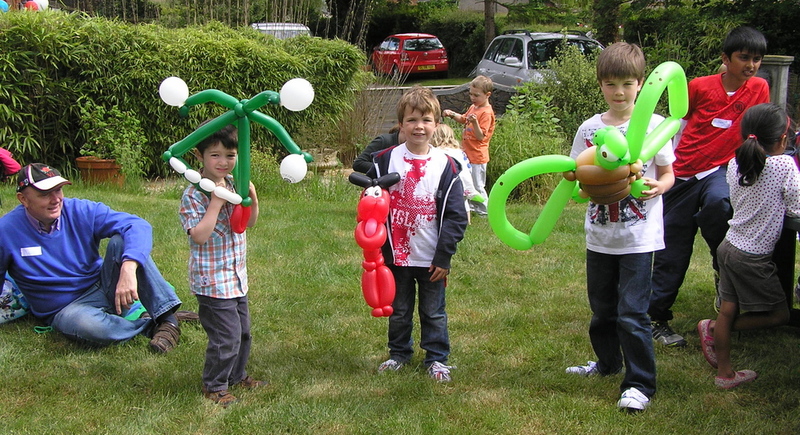 Another great idea is Wayne Wonder's strolling balloon art, he is completely mobile and can walk around an event providing amazing balloon creations unlike anything you would have seen before, take a look at the pictures below to get an idea of what Wayne Wonder can do. Are looking for fun and imaginative ways to increase your fundraising? Well Wayne Wonder has thought about you too. An increasingly popular idea is for Wayne to put on a 30-45 minute show, to entertain, impress and bowl over everybody! The idea is that you can sell tickets to attend the show and Wayne Wonder will even give you a special discounted rate to help maximise your profits. Please do get in touch (here) for more details on how this works.